The Governorship primaries of the All Progressive Congress (APC) in Akwa Ibom State has ended in a stalemate. An argument ensued between the Senior Special Assistant to President Buhari on National Assembly Matters, Senator Ita Enang and former Minister of State, FCT, Senator John Akpan Udoedeghe which led to exchange of blows. The party had agreed on direct primary format to chose its flagbearer to represent the party in next year's governorship elections. According to reports, party chieftains had gathered at the state party secretariat along Ikot Ekpene road to fine tune last minute preparations and collection of materials. Eyewitnesses said Udoedeghe held senator Ita Enang by the shirt and unleashed a slap on his right cheek before attempting to kick him on the thigh. Enang however remained calm as party chieftains intervened in the exchange. Udoedehe, an aspirant, accused Enang of conniving with Senator Akpabio and NDDC MD, Nsima Ekere to hijack materials meant for distribution to ward centres and instead presenting fake materials. Meanwhile, reports say that at about 3pm, gunshots were heard at Primary school, Afaha Offot, Uyo and materials taken away by gunmen. 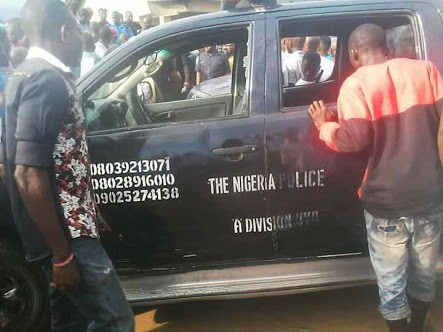 According to Akwa Ibom Daily, atleast 2 people were feared dead after gunshots were also heard near the APC state secretariat along Ikot Ekpene road, Uyo. The party is yet to make the formal announcements on the stalemate.